Happy TGIF Crafters! I was looking back of my projects last year and I just can't help to RE-SHARE this Christmas Shop Card. We all know that one of the aspects of Christmas is gift-giving, and some people start their Christmas shopping early or like me and my husband.. we always do last minute shopping. LOL! This S.W.A.L.K. Shop Till You Drop stamp set is so cute! Look at her, isn't she adorable? I bet you want to go shopping like her right now. Lol! I remember, I really enjoyed making this project last year. Although, it took me longer than I expected to finished it. Actually, I spend more time looking and looking and looking at it! I just want to get the results exactly the way I envisioned it. 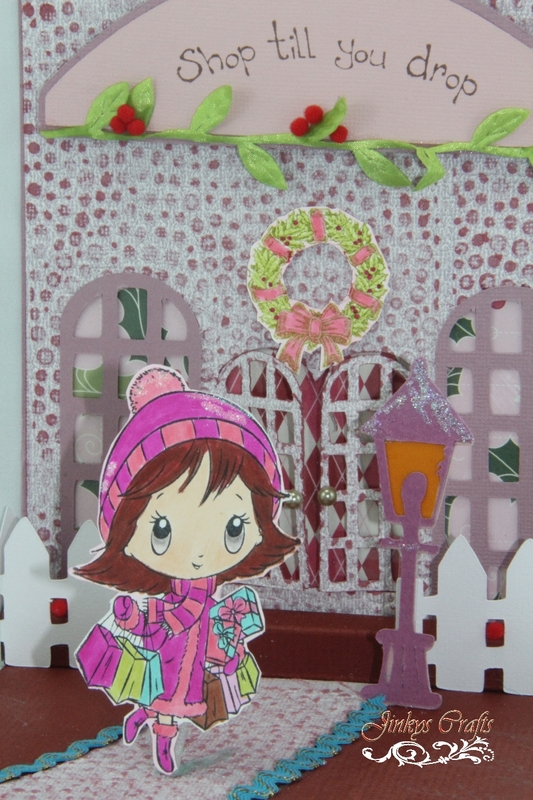 I have to say thank you to Penny Duncan for sending me her Christmas Shop Cutfile. The Christmas Shop background and the SWALK image is a perfect combination, don't you think? Thank you for stopping by. Hope I inspire you today! hubby can eat left overs...lol I am still here in awe of your work...this is soooo adorable I loveee Pennys Designs!